With the onset of hatching season for the saltwater tolerant American crocodile, Crocodylus acutus, the people of Ambergris Caye should be cautious around Belize’s shores. Although typically a shy timid species, some American crocodiles around this time of year tend to be more aggressive to protect nests and young. ACES places our highest priority on public safety and governs a country-wide problematic crocodile program to respond to croc calls regarding specific croc-human concerns. 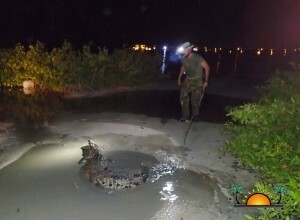 While there are currently numerous researchers in Belize studying crocodiles, ACES is Belize’s only crocodile rescue and research program operating under a Memorandum of Understanding with the Belize Department of the Environment: Ministry of Agriculture, Fisheries, Forestry, the Environment and Sustainable Development. ACES works diligently to keep locals and visitors safe by educating on how to coexist with these amazing and eco-important apex predators. • Do Not Feed Crocodiles: If crocodiles see you as source of food, one day you may become the food. Besides being dangerous and illegal, feeding crocodiles lessens their natural fear of man and they begin to associate, and seek out humans and pets as a food source. 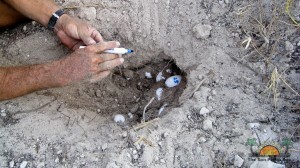 This direct feeding creates a problematic animal that eventually has to be removed. • Clean Fish at Sea or Home: Cleaning the catch of the day near the water’s edge, boat ramps, or docks is the same as feeding a croc. This indirect feeding has the same end result as directly feeding a croc and eventually leads to croc attacks on pets and people. • Toss Food Scraps in the Garbage: Food waste attracts rodents, raccoons, and fish at the water’s edge, which are all natural prey for crocodiles and hence attracts crocodiles. • Look for Slide Marks: Be aware of croc tracks around shorelines, including slides, tail drags, and disturbed ground. Avoid these areas for they are most likely croc territory. • Beware Dusk to Dawn: Don’t swim in croc territory during their meal time! • Stand Back: Stay a few feet from the water’s edge, especially when fishing; and, keep pets away from the water’s edge as well. Small pets attract crocodiles, never swim with your dog. • Never Harass a Croc: Even small crocs bite and can cause serious injuries; and, hatchlings (baby crocs) often have nearby protective mothers. Feeding or harassing crocodiles is illegal for your protection! ACES cooperates and works hand in hand in partnership with the government for the proper management, rehabilitation, conservation, and protection of crocodilian species in Belize. Founded in 2006, ACES is a non-profit organization dedicated to the conservation of Belize’s critical wetland habitats and protected species through scientific research and education in order to preserve wildlife for future generations. ACES’s number one goal is human safety. ACES has rescued hundreds of American and Morelet’s crocodiles from inhumane and illegal captivity; polluted environmental conditions; poachers; and imminent death at the hands of man due to their problematic status. “It’s not just the crocodile that we save that is important; but the fact that what we do keeps people safe and potentially saves human lives by removing large problematic crocodiles from under homes and local swimming holes where the likelihood for croc-human conflicts is the highest.” Nuisance crocs are often relocated to non-populated areas, while problematic crocs, those that are more aggressive; have attacked people or pets; or repeatedly return to a populated area; are normally placed into captivity at ACES Crocodile Eco-Sanctuary now located at the Rainforest Adventure Zone in Sandhill, Belize. Here the crocodiles can reside at peace in natural and yet secured habitats. The Belize Forest Department states that, “this newly formed partnership between ACES and the Rainforest Adventure Zone (RAZ) will institute an essential, educational, crocodile refuge at Mile 16 along the Phillip Goldson Highway for the short, medium, and long term protection of rescued Morelet’s and American crocodiles in Belize.” All crocodiles are the property of the Belize Government, who thus has the final determination as to any animal’s welfare.